As in any intellectual pursuit, reconstruction of evolutionary pathways can be tainted by inherent biases of the researchers. One of the most revealing examples of this tendency is provided by the fossil White Sharks, Carcharodon carcharias and its relatives. Widely perceived as the ne plus ultra of sharkdom, the modern Great White has long been assumed to be the grandest, most polished revision of lamnoid evolution. The White Shark is a member of the family Lamnidae, which includes three genera: Carcharodon, Isurus, and Lamna. In Oligocene deposits about 30 million years old, teeth have been found that are very similar to those of the White Shark but lack the serrations that characterize the genus Carcharodon. Since the extant mako sharks of the genus Isurus have teeth that are always smooth-edged, these fossils have traditionally been classified as Isurus hastalis. Miocene deposits, about 23 million years old, in Italy have yielded very similar teeth, but with faint serrations near the tip of the blade. These teeth were classified as Isurus escheri, and were regarded as 'proof' that the modern saw-toothed great white evolved gradually from smooth-toothed mako sharks of the genus Isurus. But nature is often subtler than human ideas about how it 'works'. Paleoichthyologist Henri Cappetta, one of the most distinguished researchers on fossil sharks, noticed that fossil teeth of 'Isurus' hastalis are very similar to those of the modern White Shark. 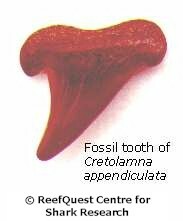 In fact, Cappetta has remarked that the two are so similar that fossil Carcharodon carcharias teeth in which the serrations have been abraded away by geological activity are virtually impossible to differentiate from specimens of hastalis. In 1995, paleoichthyologist Mikael Siverson began to question the assignment of hastalis to the genus Isurus. Based on striking similarities between the root shape and overall structure of the tooth blade, Siverson now believes that hastalis and escheri are not makos at all, but direct ancestors of the modern White Shark. Siverson has therefore suggested that they should be re-assigned to the genus Cosmopolitodus. This view has also been adopted by paleontologist David Ward and seems to be gaining acceptance in at least some paleontological and fossil collecting circles. The assumption that saw-toothed Carcharodon evolved from smooth-toothed Isurus is based on the idea that the appearance of serrations coincides with the origin of the genus Carcharodon. But it's relatively easy to serrate a tooth, as shown by many clearly separate shark lineages which have independently evolved serrated teeth. A newer interpretation of the lamnoid fossil record holds that the Carcharodon lineage was originally smooth-toothed and is actually older than that of Isurus. According to this scenario, the Carcharodon lineage can be traced back to the smooth-toothed Isurolamna inflata, which lived about 65 to 55 million years ago. I. inflata gave rise to Macrorhizodus praecursor, which lived about 55 million years ago and had smooth edged but broader teeth than its ancestor. Praecursor gave rise to Cosmopolitodus hastalis, which lived about 35 million years ago and developed even braoder teeth. Hastalis, in turn, gave rise to Cosmopolitodus escheri, which lived about 25 to 20 million years ago and had weak serrations on its teeth. And finally, escheri gave rise to the modern White Shark, Carcharodon carcharias, which appeared some 11 million years ago and had the coarsely serrated teeth for which the genus is renowned today. Therefore, Carcharodon and Isurus both descended from Isurolamna inflata and many smooth-edged fossil teeth originally named Isurus are in fact part of the Carcharodon lineage.